Simpler Times Lager from Trader Joes, brewed by Minhas Craft Brewery, was basically a craft beer Budweiser that did not taste like soap. It is a corn flaked beer or beer with really cheap ingredients that was 6.20 abv% . It was weird to drink after drinking so many well done craft brews. But what more could I ask for $0.67 usd. It was a canned beer I picked it up at Trader Joes on a whim. I served it out of a good glass. This American Adjunct Lager, a beer style fashioned for mass production, lived up to what it was born to be, cheap! The beer was super clear. It actually had a decent, mildly sweet smell to it and the beer was highly carbonated . The mouth feel was weak and this beer had a low drinkability. It was the kind of beer you give to a person who you did not want to waste your good craft beer on. Simpler Times Lager really helped me appreciated fine crafted beer. Brews that thought was put behind. This beer proved the old adage ‘you get what you pay for.’ Now, Simpler Times Lager was not the worse beer I’ve ever had, but those beers were skunked or macro beers. Will I drink this beer ever again? Probably not. I have to disagree. I just picked up a 6-pack of Simpler Time’s at Trader Joe’s yesterday, it was the Pilsner, and was 5.5 alc.% content and in a bottle form. I was surprised how good it tasted for what I paid($4.99 USD). And today I picked up the Lager form of that same beer, which has an alc.% content of 6.2(wow! ), and will see how that one tastes. Cool site, by the way. I just popped open a can of this myself on a hot summer afternoon, and I was interested in hearing what others had to say. To me, this beer does not belong in the same category as other craft beers. When I want something good, I’ll go for a Ninkasi, Deschutes, or Rogue. I normally like something with strong floral or citrus-y hops, but for a hot summer day, this stuff isn’t bad. Certainly better than any of the macros I’ve tried, and even better than some of the pricier macros like Corona or Red Stripe. Again, it is by no means great, but for $2.99 a six-pack, I’ll lower my taste standards a little bit. Barely better than PBR and a couple dollars cheaper…so i love it. And yes i do love those sixers that run $15, or a nice 750ml Belgian for $10, but lets keep things in perspective. this beer isn’t trying to be all that. I disagree with Malaleb, American Adjunct Lager is a recognized style, and leaves it open to interpretation from any craft brewery. Malaleb i paid $3.99!! maybe Michigan tax? damn. I am not a big beer drinker. I prefer red wine, but I like a beer at a local brew pub once in a while. Simpler Times is $2.99 before tax, tip and dealer preparation here in Northern California, so this makes it an alcohol bargain equal to Two Buck Chuck or Steel Reserve. I will probably spend more on Two Buck Chuck between now and the end of the year than on Simpler Times, but it’s an easy drinking beer that goes great on a hot afternoon. And at 6.2%, two cans worth gives me that much desired “Okay, that’s enough” feeling that many American beers never deliver. I never buy Steel Reserve. Just a couple sips gives that “Okay, that enough for the rest of my lifetime” feeling, which is not what beer makers are going for. I bought this $h*t at TJ’s tonight. It was the cheapest they had. I’ve been drinkin’ Pabst and Hamms lately. I like Hamms more. I just wish that regular stores carried more variety. I’ve gone through most everything at the local supermarkets and Wal Mart, etc. Trying it: tastes like Hawaiian Punch mixed w/ corn flakes. Simply awesome! Simpler Times is possibly the BEST-BUZZ-FOR-THE-BUX-BEER going. Tastes good, and at 6.2 abv. for a $2.99 sixer, I MUST COMMEND TRADER JOE’S for the company’s contribution to our fine nation of alcoholics, myself included. HEY — while you’re drinking a beer or twelve — why not check out my BLOG at the link above. And…THANKS FOR DRINKING! Wish Simpler Times was more popular that Pabst. At $2.99/sixer at Trader Joe’s, you just can’t beat that price. Good to wash down spicy Mexican food. Three Simpler Times later, and I felt like I was harkening back to…Simpler Times. Nothing expected, thus, not disappointed. My BF and I diiiig Simpler Times during those times when our budgets are both depleted. Thanks Trader Joe’s! We’re ‘takin’ it back’ to Simpler Times!!! 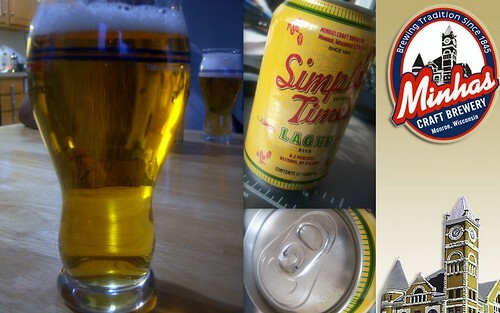 I recently bought Simpler Times Lager from Trader Joe's. This beer has a very good taste profile except for the sweet after taste that killed it for me. It was so sweet, I had to add salt to counter the sweet after taste. If they can cut the end point sugar level down, this would be great beer for the money. This is old, but I have tried this beer when I first moved to Oakland, Ca. My Trader Joes in Simi, did not carry it yet. I liked it for it's difference.More like a Miller High Life than a Budwiper. Just picked some up today, and could not wait for it to get cold. Darn good warm beer! Better really cold though. Since being here in Oakland I have tried a lot of the craft beers. Love Racer 5, and Boonts. also the Lagnitas IPA, and Prohibition Ale.